Is it time to redraw the map of London to reflect the reality of its huge economic pull on the wider south-east? New data released last week shows what an even “greater” London might look like. Many British cities have boundaries that don’t match reality – Bristol for example has substantial suburbs that actually lie in neighbouring authorities. Greater Manchester is split between ten councils, which have worked hard to overcome this administrative handicap. London has been growing faster than any of these, and it seems reasonable to ask whether its political boundaries still make sense. We’ve done this twice before: In 1889 the London County Council was created (roughly matching today’s inner London) to recognise that the Victorian city had spread way beyond the old Roman-walled square mile. Then in 1965 the Greater London Council took in the metroland suburbs to form the capital’s current shape. In 1965 London had a rapidly falling population. Now it is booming – with a million more people in the last decade. On top of this, a further 800,000 people commuted into London for work in 2011. That’s nearly 10% up on the previous Census, and has probably increased even further in the last three years as the recovery gathered pace. A soaring jobs market, plus a shortage of housing, adds up to growing pressure on regional commuter rail routes to bring the workforce in from elsewhere. That’s why we need investments such as Thameslink, Crossrail 1 and Crossrail 2, to better integrate central London to the wider south-east of England. 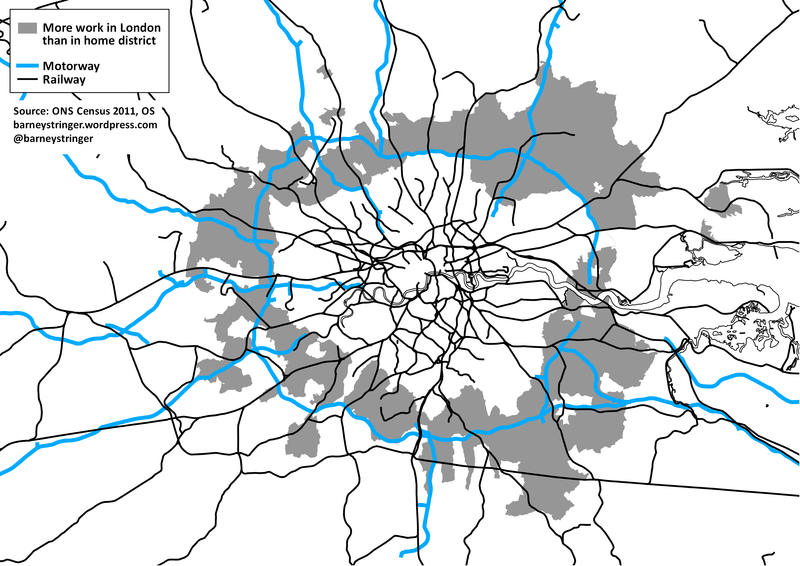 If London’s boundaries now contain its economy so poorly, where should they be drawn? That of course is a very political question, and fifty years ago some districts fought furiously to avoid becoming part of London. But the latest Census data on travel patterns offers a good starting point. The map at the start of this post shows what proportion of workers in the area around London commute into the city for work. The areas I’ve highlighted in blue are places where more people go to work in London than go to work in their own district (NB home workers are not included in these figures). These are not so much dormitory towns, as a whole dormitory belt around London that is utterly dependent on the city for work. In many cases entire districts – Epping Forest, Spelthorne, Epsom and Ewell, and Three Rivers – provide fewer jobs for their residents than London does. More than 1.3 million people live in the area marked blue. Every day, many of them decant into London. Their council tax does not contribute towards the services they use there during the working week, nor do they get a vote on how those services should be provided. Is it time redraw London’s boundaries once again, to embrace these areas that already function as part of the city? Or are there other ways to integrate London’s hinterland, perhaps by giving the Mayor of London greater powers over transport and housing beyond London’s boundaries? Many thanks for all the feedback on Twitter. Several people have asked how this area relates to the M25, which is a good question as the orbital motorway is often seen as a handy approximation for the edge of London. So I’ve done another version of the map below, that shows it in relation to transport (motorways and railways), rather than the political geography of the version above. This time the “dormitory belt” of areas where London dominates employment is in grey. Not surprisingly (as this is by definition commuter land), it shows an area already quite well-integrated into London’s transport network. This entry was posted in Economics, Housing, Planning, Population, Transport and tagged House building, London, London County Council, Planning, Population, Quod by barneystringer. Bookmark the permalink. Why not give London a three Tier Government. We can keep the Mayor and London Assembly but expand it (to include places like Watford and St Alban) at the same time insert between the upper Tier and the lower Tier three Urban counties call them London Country Council (which includes the areas of Greater London from before 1965), Outer London (including former areas of Essex, Kent, Buckinghamshire and Surrey) and Middlesex (back to former boarders including Potters Bar) places like South Hertfordshire could have areas that have the right to vote in the expanded about in regards to London Assembly. The London Boroughs would become the three Tier and they would lose power over certain services to the Urban Countries which would take over rubbish collection, housing, education and take from Transport from London control of mini cabs, black cabs, buses, trams and light railways. There would be four Transport executive one for inner London, one for South London, one for Middlesex and one for North Middlesex and Southern Hertfordshire. The aim of the executive would be to improve transport inside each country but not London wide (that would be the job of a slimed down Transport for London which would control the Underground, Overground and Crossrail) but each executive could ask Transport for London to expand its network (think in South Hertfordshire the Dunstable Branch Lines, Northern and Piccadilly underground being expanded). In Middlesex we could have the West London Tram built and the East-West London light railway (maybe call it the Middlesex Light Rail network?). In South Hertfordshire the Abby Line and the abandoned railways like Hatfield & St Albans Railway (which would see Abby way become a Tramway) and Dunstable Branch Lines (also as a Tramway) would greatly improve transport in Southern Hertfordshire if a link with Luton could be built. The other two areas could see the cross river tram built and maybe a tram in Oxford street replacing the buses. Both the Docklands light railway and the Tramline in Southern London would be taken over and expanded. Does anyone think this would be a good idea? I hear the Labour Party in Spelthorne have unanimously backed a motion to support a move from Surrey County Council and become part of London. Seems like a good idea based on all the turmoil in Surrey! Don’t think Spelthorne is big enough to become a borough on its own though, so a bit of reorganization may be needed. I would suggest Heathrow going to Hounslow, Feltham, Bedfont, and Feltham going back into Spelthorne, along with all the towns north of the river currently in Richmond joining them, and Richmond merging with Kingston. This would also allow some reorganization around the Kingston area, and for the formation of a new London borough with some of those fringe areas around Kingston joining London too. Oops!! “….Feltham, Bedfont, and Feltham…” should read Feltham, Bedfont, and Hanworth. I am from Manchester in the North West and we need Greater Manchester looking at once again in my opinion,we definitely need similar things like London has,is up here more Metrolink etc.And I think it is time that the map of Greater Manchester is redrawn and possibly being made into a bigger region. It has been over 2 years since this report was published, I don’t think anyone is surprised about London’s boundaries needing a reality check. Do we know if the authorities are looking to correct the London boundaries? Are the wheels already in motion? Who are the authorities that can make this happen. The LGBCE only deal with small alterations now, so if not them who? Excuse me coming so late to the party, but on recent searching I’m struggling to find anything more recent on this subject. Whether appropriate or not, it seems to me that a clever politician might look to solve “London’s” housing problem by enlarging the Greater London area. There would be fierce opposition I’m sure, but is it simply a matter of time before this happens? Significant resources would need to be promised for this to stand a hope of becoming a reality. Thanks for the comment. Related to resources, one of the interesting things I learnt from the response to this post (which included BBC and lots of local papers), was quite how important TfL is as a bargaining chip. London benefits from an unusual regulatory regime, and outside the capital public transport is so much more fragmented and uncoordinated. Coming under TfL’s remit is seen as a major benefit. A lot of people responded to the suggestion of a larger Greater London by saying “fine, so long as it means we get the Travelcard”. And a similar negotiation is likely over Crossrail 2 – “homes for stations”. Although bus services have improved over the last few years, they are not “joined up” in the way they were when London Transport operated both Central and Country services. Reorganization has seen all public transport in London becoming more integrated, the opposite has happened outside the Greater London boundary. County councils seem to believe they only need to look after their own residents, it’s like travelling to a different country when crossing into different local authority areas. The whole of the Southeast of England needs a single transport authority, which I am sure would eventually lead to an expanded Greater London. Hi Barney – I would like to use your maps in some lessons for GCSE geography – is that OK? Please do, and if your students have any question, do ask here and I’ll try to answer them. I agree with you completely, it is logical to use the M25 to define London. We currently have an outer london telephone dialing code but for some reason the existing parameters require to be rationalised and co ordinated. I agree with you to a point, maybe the M25 is a good barrier in my part of North London. Elstree & Borehamwood use to be in the London Borough of Barnet and were taken out, It was stupid because we have the same London services and families in all London Boroughs, over the years it’s become even more ridiculous because of the power the Mayor has effects us and we have no say in the matter so the London Boundaries need a correction immediately. It’s amazing to think in the mid sixties Londons population was actually falling. Now with the boom times of the last 30 years the only answer seems to be many more high rises in central areas. Of course the flats contained within have to be affordable which is always the rub in the scheme of things. I am sure the late Peter Hall proposed extending Greater London’s boundaries along similar lines a few years ago in an article in either Planning or Regeneration & Renewal, can’t remember which. The piece may have been based on academic research. If anyone can find the article, would be fascinating to read again. I feel nearly all of our cities and large towns are under bounded, including the biggest one. It’s also interesting to think about the “London” postal town: i.e. anything with a point of the compass postcode and the word “London” at the end of the address. This was not created for any other reason than to make it easier to sort mail, but the revised map of 1866 (largely unchanged to the present day) – larger than the BMW/LCC area but smaller than Greater London today – probably does reflect the extent of London at that time better than actual political divisions, given that it was based on the practical issues of delivering mail from the post office’s London sorting offices. At last, recognition that some suburban areas of London, should be part of the capital rather than sitting on its periphery! The one area which stands out above all the rest is the Borough of Spelthorne, which is administered by Surrey County Council. Along with Potters Bar, it was excluded from becoming part of Greater London in 1965 – despite being in the Metropolitan area for nearly all its services, such as: gas, electricity, waste water, telephones, mail, police, transport, and health! It has only three roads connecting it to Surrey, each of them river crossings – two in Shepperton, and one in Staines – whereas there are countless connections to the three adjoining London boroughs! Also, parts of Spelthorne keep getting lost to other areas, the largest chunk being the part of Heathrow Airport where the Cargo Centre and Terminal 5 stand. It is time the whole of Spelthorne was returned to the Metropolis, perhaps Surrey will then stop treating it like a boil on its bottom! The Commission did not feel that it was in its remit to make major changes to local authorities but stated that “in the long run a clearer definition of the boundary of London would assist effective and convenient local government in the communities on both sides of it”. The main driver for expanding the political boundaries of London have been primarily for reasons of political control rather than functional reasons, the creation (and abolition) of the overall body – only the move to larger lower-tier units (vestries to Metropolitan Boroughs to London Boroughs) has been for reasons of administrative efficiency. The pattern has been that when the party of Government can no longer control “London”, they expand (1888 and 1965) or abolish (1986) the previous arrangement. The argument of functional urban areas becoming the building blocks looks rational when looking at the “under-bounded” cities – Nottingham, Oxford, Cambridge, Norwich – but London’s sphere of economic influence spreads much further, and the “logical” argument for expansion is in many ways less clear. Ultimately it is a question of political control vs localism – there are still people in Outer London who hang onto the belief that they still live in Surrey, Hertfordshire, Essex, Kent or even Middlesex – which shows that people further afield won’t have the appetite for being annexed by an expanding London. They want their independence and local identity rather than be voting fodder to regain political control of London. You are quite right, of course, tho’ whether commuting to irk should be the sole criterion is an open issue. So far as commuting goes surely your criterion for the map (more going to GLA than working in home district) contains a misleading element in that home districts vary hugely in size (measured in number of jobs). Absolute flows would be a valuable check; so would % of active pop working in GLA (which is the one geographers have always focused on). Of course there is the political point that the left will always tend to oppose boundary extensions insofar as they are seen to bring more conservative (small c, and including far right) voters into the metropolitan voting roll. Great points, thanks. Commuting isn’t everything, there are other flows (shopping, leisure, education), and the Boundary Commission has also usually taken account of “sense of identity”. Although by that measure plenty of people in parts of existing London still insist on using the Royal Mail’s definition, even “Middlesex”! Interestingly there are very few areas where more than half of resident workers commute into London, but I don’t think that fully captures the influence of London. We don’t yet have Census flow data by industry or occupation, but my guess is many of these places are utterly dependent on being part of central London’s economy, with the big majority of better paid professional employment there (ie most of the area’s income being earned in London), but in numbers of jobs that being outweighed by the local services that accompany any residential area (health, teachers, retail workers etc). So the measure I’ve used is an attempt to show degree to which an area has an economic gravity in its own right, beyond just being a commuter town. You’re absolutely right that this depends on boundaries and local jobs, but in a way that’s the point. The districts without their own major centres of employment (eg Epping Forest) show up blue as being dependent on London. Those with their own employment centres (like Slough), show as being a bit more self-contained. I just visited London for the first time since moving away almost 10 years ago. My reaction isnot that London is too small, but that it’s become too big. Under Boris Johnson London has concentrated it’s development into the centre of London, which is probably why they keep drawing more from further away. Canary Wharf appears to have stagnated, with all the out-of-scale building concentrated around Fleet Street. Other than the (relatively) modest Strata SE1, there’s no housing development to match the commercial, so you can only keep reaching further out. London needs to develop more Canary Wharfs; a distribution of commercial centres around the outer ring of the 1965 city. Does anyone really think there’s any reason to concentrate all this development in one area? It certainly has nothing to do with proximity – most businesses on the 15th floor couldn’t tell you who’s on the 16th, never mind actually do face-to-face business with them. All of this concentration of jobs in gigantic buildings is purely an exercise in glamour and personal aggrandizement, by both the developers and by Mr Johnson. Is there any other explanation for the disappearance of the lovely (and perfectly scaled) Gherkin behind behemoth office towersa than Mr Johnson trying to wipe away the signature architecture of his predecessor? The monster developments of the Shard, Cheese Grater, Walkie-Talkie, et al have done nothing to improve life in London. All they’ve done is ensure that Mr Johnson’s mark (sacr?) will remain for decades. In fact, they’ve done just the opposite, forcing tens of thousands of workers to travel to a smaller and smaller space, while making them come from farther and farther away. London needs to start planning a way to better use it’s current real estate, infrastructure, and people before it starts gobbling up more and more area. Or else it will implode on itself and become an inner ring of wealth and privilege whilst the outer reaches become “middle class slums” desperate for decent services as they are forced to support the black hole of commerce around Monument. Thanks for the comments. Your’re right about the increasing concentration of employment in the centre. Many suburban office locations are struggling as businesses increasingly want to be based in or around central London, where they have access to such a huge pool of skilled people and a network of suppliers. Interesting you say there aren’t many central high-rise residential developments – judging by the pipeline of planning applications that’s going to change in a big way over the next few years. Not everyone’s happy about that but it’s hard to see how housing need can be met without that as part of the solution.